It’s hard to imagine that 20 years ago, half the beaches in Barcelona didn’t exist and the other half weren’t used for leisure and tourism. Since the Olympics were hosted in the city in 1992, the amount of beaches has increased massively and they all have something to offer. From enjoying a game of beach volleyball on the golden sands to relaxing and topping up your tan, there are plenty of beach activities in Barcelona to suit everyone. 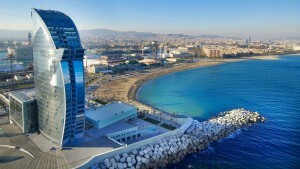 In fact, Barcelona has even been awarded ‘best beach city’ status by National Geographic. If you’re planning on spending your time at the ‘playa’, our top 10 beach activities in Barcelona will help you plan your trip. Exploring Barcelona can be tiring work! Grab your beach towel, factor 20 and enjoy a day relaxing on one of Barcelona’s stunning beaches. With its 4.5km stretch of golden sands, you’ll be able to find a great spot to chill out for the day. 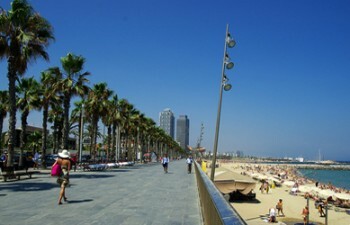 Barcelona’s climate throughout the summer makes it the perfect place to enjoy a day by the beach. Some beaches have free wifi access so you will be able to update your whereabouts online to make sure that all your friends back home are jealous! Positioned on the Mediterranean, Barcelona’s beaches are smooth and calm making swimming in the sea a relaxing experience. Although, if swimming in the sea isn’t your thing, Club Natació Barcelona, situated in Barceloneta, has a spacious swimming pool overlooking the beach – so you’ll never be far from the sands. Fitted with sun loungers and a great view of the beach, this is a great spot for those wanting a more relaxing experience. Take a boat trip with SkylineBCN and explore the very best of the Catalan coastline. The two hour sailing trip is one of their most popular tours. Sail on the open sea and enjoy sensational views of Barcelona from the water, whilst also learning some sailing techniques from the professional skipper. You’ll sail past such landmarks as the Statue of Columbus and Port Vell. SkylineBCN offer other boat trips too, including yacht and motorboat excursions. 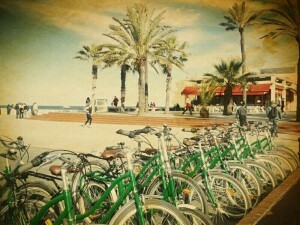 If you enjoy a pleasant, easy bike ride, we recommend renting a bike in Barcelona to cycle along the beach front. Many of the best bike rental companies in Barcelona offer hourly and daily rental rates. Starting at just 1,50€ per hour with Green Bikes, you can ride along the harbour before making your way to Barceloneta beach. This beach activity is great for those on a budget and for those who want to explore Barcelona beaches without having to walk. Running in the open air by the sea has many benefits for your lung capacity and stamina, with Barcelona’s long stretch of beaches it would be a waste not to use them if you enjoy running! You can also find a range of outdoor gym equipment that is free to use for everyone. For people who enjoy training in groups, Barcelona Beach Fit will provide great workouts by the beach for all fitness levels. 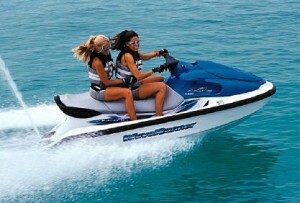 I f you want to try out a different water sport experience, Jet Skis are readily available to rent from many beaches. From 30 minute practices to full day excursions along the coast, there are great views of the city’s skyline to be seen – if you’re able to stay on the Jet Skis for that long! This beach activity should be considered by any thrill seekers heading to Barcelona. Ping pong (aka table tennis) tables can be found everywhere in Barcelona city, especially on the beaches where you can enjoy the fun sport for free, but as long as you bring your own bat and ball! Ping pong tables can be found on Barceloneta, Nova Icaria, Bogatell and Mar Bella beaches. Beach volleyball is popular along the shores of Barcelona. You’ll see locals playing along the beaches all year round. You can also get involved at Nova Icària beach next to Port Olímpic. You can also play separately, but don’t forget your own ball and net to fix to one of the courts. 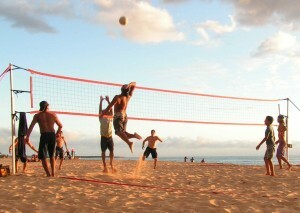 If you’re a more experienced player, through Meetup you can compete with other experienced players for a game at the beach. Fancy trying out something new and audacious? A Hoverboard experience may just be the thing for you! Inspired by the film “Back To The Future” and Powered by jet streams that push you into the air and above the sea, the Hoverboard experience makes you feel like you’re surfing and flying a the same time. This activity is not for the faint-hearted, so make sure you’re prepared before testing out the Hoverboard. For an extreme experience, you can fly over the pristine Mediterranean ocean with the amazing parasailing experience. Floating over the sea, you will be able to see the beautiful Barcelona skyline and also many of the cities famous attractions.This activity is more for the adrenaline junkies, but once in the air the experience is meant to be overall relaxing and mesmerizing. Parasailing in Barcelona is offered by many of the water sports companies by Port Olímpic and costs around 90€ per person. This entry was posted in Activities, Home, Things to do, Tourist Guide and tagged barcelona activities, barcelona beaches, Barcelona Parasailing, barcelona tourist guide, barceloneta, barceloneta beach, summer in barcelona, things to do in barcelona. Bookmark the permalink.